Although we built a name for ourselves teaching children and adults how to be fierce competitors in the world of judo, Cohen Brothers Training Centers also has a robust schedule of jiu jitsu training classes in the Greater Chicago area. Including Brazilian and other popular jiu jitsu styles, our training classes were formed to meet the growing demand for jiu jitsu training that has come in the wake of the rapidly growing mixed martial arts phenomenon. Jiu jitsu is an incredible workout as well as a member of the noble fighting arts. Rest assured, when you come to Cohen Brothers Training Centers for jiu jitsu classes, you will leave sweaty! In addition to joint locks, chokes, and strikes, jiu jitsu classes will help you to be a more resilient person in general. Here are just a few of the life lessons we believe you’ll gain when you come to Cohen Brothers for jiu jitsu classes. Life hands us many challenges, and guess what? There’s absolutely no way that you’ll emerge from all of them victorious. There will always be competition in every aspect of life, and often, your competitors will be bigger, stronger, and faster than you. You’ll fail, but the question is, how will you react to that failure? 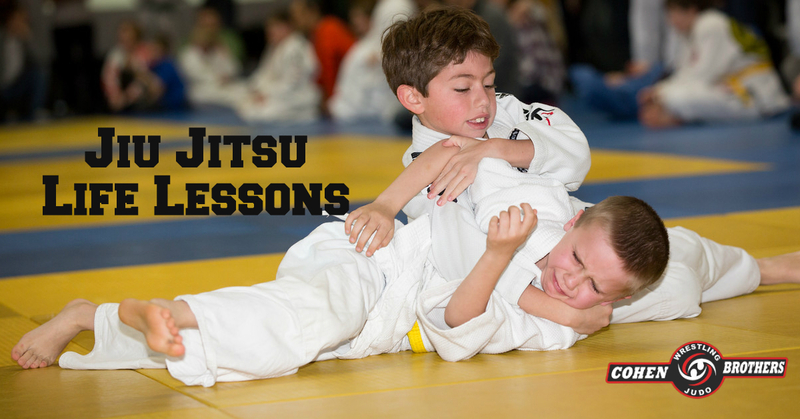 In our jiu jitsu classes, we teach kids to learn from their mistakes, to use losses as motivation for practice, and to manage the emotions that come from failure in a mature way. If you want to go from a newbie to an expert in six short weeks of classes, jiu jitsu isn’t for you. While we’ve helped people from all walks of life embrace the jiu jitsu discipline, we’re very clear about the fact that it’s only through hard work that you’ll achieve success. Are you willing to log the hours it’ll take to become a fierce competitor on the mat? There are no shortcuts to success in this sport, just like there are rarely shortcuts to success in life. In this age of rampant obesity and body shaming, Cohen Brothers Training Centers is here to help people rediscover their greatest physical possession: their bodies. Regardless of how tall or short it is; how heavy or lean it is; or even how old it is, your body is a marvelous machine. Even though it might not seem like it right now, you won’t have to take jiu jitsu classes with us for very long before you start feeling stronger and more confident in your body than ever. While the purpose of jiu jitsu training is to teach you to subdue any opponent, regardless of size, the end goal is not to hurt them. More than anything else, jiu jitsu is based on respect for your opponent, assuming that they have the skills necessary to best you, and finding a way to win despite it. Although they may be fierce competitors on the mat, many of the people in our jiu jitsu training classes are friends as soon as they stop off of it. Want to learn these life lessons for yourself? Contact Cohen Brothers Training Centers to sign up for jiu jitsu classes in the Vernon Hills and Greater Chicago area today!